Buxtehude's Funereal Music for the funeral service of his father is one of the few pieces published during the composer's lifetime. 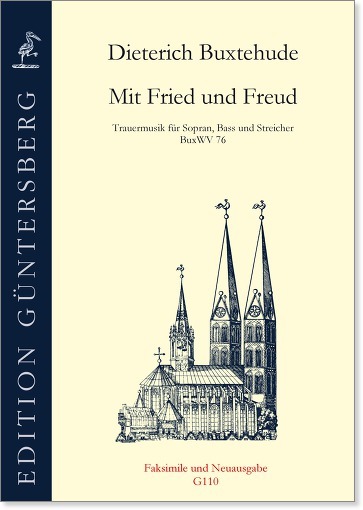 It consists of two four-part compositions: The musical version of the chorale Mit Fried und Freud in elaborate double counterpoint in which the chorale is placed alternating in the treble and in the bass, and the very personal Klag-Lied which has the melody in the treble. The instrumental parts can be played on a keyboard instrument or on strings (V+V/Va+Va+Vc or consort of viols: DATB). 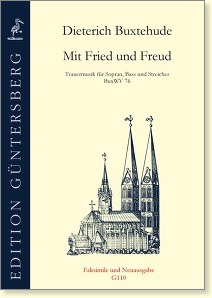 Preface by Annette Otterstedt.